I stopped by my mom’s apartment on my way home from grabbing my daughter, Lilli from school. Her school is across the street from my apartment complex. Lilli found a succulent that had been overturned and wanted to have her grandmother, ‘B’, try to save the plant (B has a way with plants). On our way over to B’s, we ran into a high school friend, Alana, who also lives in the apartment complex. She and her three-year old son, Flip, were walking home from the pool. They decided to come with us to B’s. When we got to B’s, Alana’s mom, Susan, was there having a late afternoon glass of wine. Susan also lives in our apartment community. I live in a virtual commune in the heart of Los Angeles, just east of West Hollywood and south of Beverly Hills. In my apartment, I live with my husband and five year old daughter, along with my cats, Flea and Zowie. ‘B’ lives down the street from me with her Bouvier, Penelope, and her Persian kitten, Petunia (“Tuna” for short.) Alana lives around the corner from me with Flip. Her mother, Susan, lives alone in an apartment across the street from mine. Both my mom and Susan are single 60+, healthy ladies and are good friends and had previously been roommates in Pasadena, having both relocated to California from New York to be closer to their families. Across our four homes, there’s deep and frequent connection. All of our townhouses are within a five minute walk of each other. Often we have impromptu dinners or evening drinks, grandmothers watch the kids, we help each other move furniture, our children play together, and needs for medicines or cooking ingredients are swiftly answered. We have a group messaging thread called “The Commune” for planning meals, events, or just to share stories and silly pictures. The specialness of this community does not escape me. Since working with the non-profit Atlas of Caregiving I’ve been deeply engaged in family caregiving research. One of the tools we have been using to literally map relationship and care ecosystems for family caregivers is called the CareMap. The CareMap is a deceptively simply tool that captures a person’s world and activity at a moment in time. Using stick-figures, shapes, and lines, drawing one is relatively easy. And yet the process of drawing and then sharing your visualization is deeply profound. Karen Purze from Life in Motion did a series of CareMaps at different stages of her care journey. 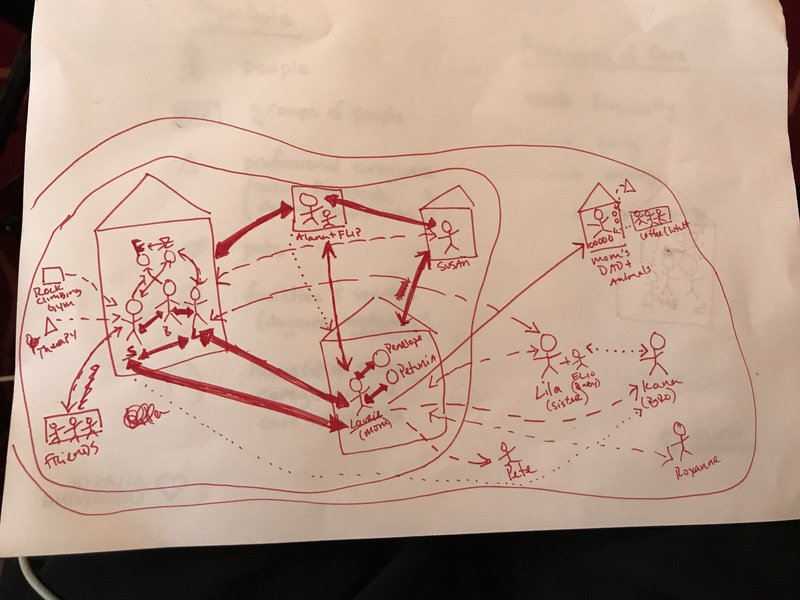 Her amazing visualization showcases the power behind these CareMaps to capture in simplistic terms the complexity inherent in family caregiving – and relationships, generally. Not unlike the art of journal writing, drawing your own CareMap and then reflecting on the created image allows you to consider relationships and the fragility of our lived worlds that much more fully. For me, seeing my commune all together on one picture, with thick reciprocal lines moving across four different homes, I think how utterly lucky I am to have what I have. Anything can happen, but with such a strong foundation, we have set ourselves up to be more resilient, joyful, and fulfilled in our lives. it’s a good place to be in. Susan Williams is founder and managing director of Agency Other, a cross-functional research and marketing group rooted in academics and healthcare that uses a unique process combining applied anthropology, design thinking and social science research to tease out consumer behavior, insights, and industry trends for branding and marketing needs. Susan also manages communications for Atlas of Caregiving.